Q: It is reported that Taro Aso, Japanese Deputy Prime Minister and Finance Minister made some inapproriate Nazi-related remarks in front of a group of political trainees. He provoked public condemnation by saying that Hitler, who killed millions of Jewish people, was no good even if his motive was right. What is your comment? A: I have seen relevant reports. It shows that there is still a group of Japanese politicians clinging to the wrong perception of history. We always say that history is the best textbook and it is also a bright mirror. When it comes to historical issues that concern cardinal matters of right and wrong, no wrong words or deeds that deviate from the international social ethics and human conscience will be tolerated. We once again urge those forces in Japan to straighten their view on history, genuinely learn lessons from history, and take concrete actions to win the trust of its Asian neighbors and the international community. Q: Japan's Defense Ministry has requested 1.6 billion dollars for new missile defense systems in response to the DPRK's missile launch this week. How concerned is Beijing that the DPRK's actions are contributing to an arms buildup in the region? A: We have noted relevant reports. Whatever reasons Japan may cite, Japan's national defense budget has been rising for years indeed, and has reached a record high. We are concerned about that. In recent years, Japan has never stopped fabricating, exaggerating, and playing up all kinds of threats it faces. In the meantime, it has been expanding its national defense budget, upgrading its military arsenal, and taking steps to implement the new security bill. All countries should be on high alert as to what Japan has done and its real motives. We believe that Japan should honestly explain its real motives to the international community. Due to historical and practical reasons, the international community, especially its Asian neighbors, has been closely watching Japan's policies and moves in the military and security field. We hope that Japan could learn from history, take heed to the security concerns of its Asian neighbors, and exercise caution in the military and security field. Q: It is reported that the German Foreign Minister said yesterday that China should follow the "one Europe" principle, instead of trying to divide Europe. What is your response? A: I have seen relevant reports and we are shocked by these statements. We hope that he can clarify what he means by "one Europe" and whether there is a consensus on "one Europe" among EU members. I believe that what he said about China trying to split Europe does not represent most European people's thinking. The EU is a regional organization composed of sovereign states, not a sovereign country itself. Other countries could develop relations with the institutions of the EU and its member states. They do not exclude or contradict each other. Actually, it is a fact happening as we speak. China always supports the European integration. I wonder if anyone in Europe could list one country that is more steadfast than China in consistently and unconditionally supporting the European integration, whether in public or in private. China attaches high importance to its relationship with the EU. When the EU faces many internal problems, I believe that China's firm support to the European integration is ever more precious and valuable and should be cherished by the European side. We hope that the relevant person could view China-EU relations with an objective and open mind, instead of a zero-sum one, and stop making such irresponsible remarks that will not help enhance mutual trust and cooperation. Q: I want to ask if China has issued the demand to Indonesia that it stop maritime delimitation talks with Vietnam and stop calling part of the South China Sea that is in its Economic Elusive Zone the North Natuna Sea? A: Let me reiterate our principled position on the South China Sea issue. Regarding the territorial sovereignty dispute and maritime delimitation issue between China and some ASEAN member states, we would like to properly resolve them through bilateral consultation and dialogue, and that is also what we have been doing. In the meantime, China would like to work with ASEAN to maintain peace and stability in the South China Sea. For the specific question you raised, we hope that relevant countries could bear in mind the broad picture of bilateral relations and peace and stability in the South China Sea, and act with prudence. We would remain in close communication with relevant countries and work together to sustain the positive momentum in stabilizing and improving the South China Sea situation. Q: First, do you expect a meeting between President Xi Jinping and Prime Minister Narendra Modi during the BRICS Summit? Second, President Trump specifically mentioned Pakistan as a country which is protecting terrorists. India also has problems of security issues and has been asking China to help out with its influence in Pakistan in apprehending and arresting terrorists based in Pakistan. Do you think this issue will be discussed or reflected during the BRICS Summit? A: On your first question, it is routine to arrange bilateral meetings during multilateral conferences. As a host country, China will make proper arrangements when time is allowed. On your second question, as we have said many times, Pakistan is at the forefront of fighting terrorism, and for many years has been making positive efforts and great sacrifices on counter-terrorism. The international community should acknowledge and fully recognize its contributions. China is willing to work with Pakistan and other countries to enhance cooperation on counter-terrorism and protect regional security and stability. We have taken note of the concerns of the Indian side on counter-terrorism issues of Pakistan, but I don't believe that it should feature prominently during the Xiamen Summit. 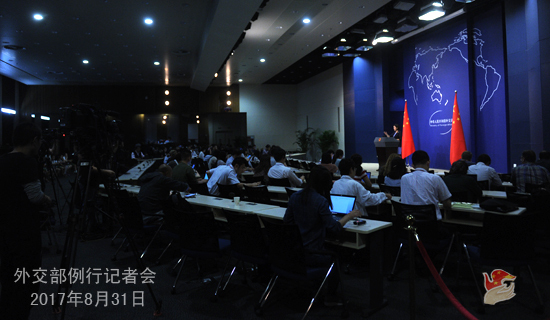 Yesterday, Foreign Minister elaborated the arrangements and envisioned the outcomes for the Xiamen Summit at the press briefing on the BRICS Xiamen Summit. We would like to work with all parties, follow the theme of "stronger partnership for brighter future", and focus on making new breakthroughs in the BRICS economic practical cooperation, moving forward political and security cooperation, and forging new pillars of people-to-people and cultural cooperation, so that a new landscape will be formed where the three wheels of political, economic and people-to-people and cultural cooperation can work in synergy and lay a solid foundation for deepening the BRICS partnership. The BRICS countries are focuing on the Xiamen Summit and the world is fixing its eyes on Xiamen. As a host, China will make positive efforts and contributions to ensure its success. We also hope that other participating parties will do the same for the success of the summit. Q: There is report that the US this afternoon has flown some fighter jets and bomber strikers over the Korean Peninsula that ended the joint exercise with the ROK's air forces. What influence will have on the whole situation? A: In recent days, you have all been so closely following the situation on the Korean Peninsula where the smell of gunpowder is palpable. We have stressed on multiple occasions that we hope various parties can remain restrained and rational and refrain from actions that may ratchet up the tension and pour fuel on the fire. We hope various parties can seriously consider and actively accept China's suspension-for-suspension proposal, and make joint efforts to bring the situation on the Korean Peninsula back to the right track of peaceful settlement through dialogue. Q: According to reports, the US, Japan and the UK plan to push for sanctions in a new resolution of the Security Council, which will impose oil embargo on and restrict the overseas labor of the DPRK. What's your comment on that? First, we maintain that all sanction measures should be implemented within the framework of the UN Security Council and in accordance with its relevant resolutions. We are firmly opposed to the so-called "long-arm jurisdiction" by any country over other countries' enterprises and individuals in accordance with its domestic law and outside the framework of the UN Security Council. Second, practice has proven that pressure and sanction alone can in no way solve the problem fundamentally. Both the previous Security Council resolutions and the Security Council's presidential statement yesterday have shown that the commitment to peaceful settlement of the Korean Peninsula issue through political and diplomatic means best serves the interests of various parties and it is the shared aspiration of the international community. Third, the Korean Peninsula issue is intricate and complex, and its core and nature are the serious lack of mutual trust between the DPRK and the US, and the DPRK and the ROK, which are the parties directly concerned. Only by addressing the legitimate security concerns of various parties through dialogue in a balanced way can we find the final peaceful solution to the Korean Peninsula issue. To this end, China puts forward the "suspension for suspension" proposal and the dual-track approach. The former is aimed to find a breakthrough for the resumption of dialogue and negotiation, and the latter to achieve the long-term peace and stability of the Korean Peninsula and the region. Fourth, the Security Council's resolutions should be followed through on comprehensively and completely. Regrettably, certain countries selectively ignore the request for promoting dialogue in the relevant Security Council resolutions and only kept stressing pressure and sanction. They put a drag on and secretly obstruct China and the relevant parties' efforts for peaceful settlement of the issue through dialogue and even stab in their back. Yet whenever the situation on the Korean Peninsula grows tense, they just once again make irresponsible remarks and shirk their responsibility. These words and deeds are destructive rather than constructive to the efforts for peacefully resolving the Korean Peninsula issue. Fifth, the current tense situation on the Korean Peninsula is neither a screenplay nor a computer game, but unmistakably an objective reality and a serious major issue that immediately bears on the security of the people of the DPRK and the ROK and the peace and stability of the whole region. We hope various parties can make rational decision and wise choice that are truly responsible for their own people and the regional peace and stability. After the press conference, the following question was asked: on August 25, extremists attacked many police outposts and one military base in the Rakhine state of Myanmar, causing heavy casualties. The central commission for counterterrorism in Myanmar said that the attackers were terrorist. The Office of the State Counselor also stated strong condemnation on the terrorist attack and pledged that the government will remain committed to finding a long-lasting solution to the issue. What is your comment? 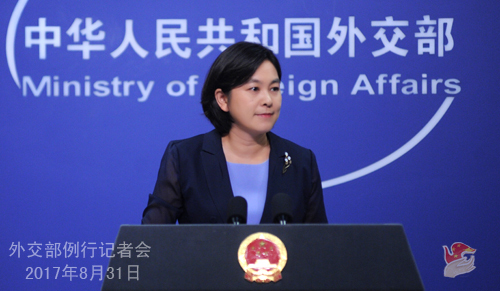 Spokesperson Hua Chunying said that we have noted these statements made by the Myanmar government. China condemns these violent attacks in the Rakhine state of Myanmar. We want to express our condolences to the innocent victims and sympathies to the innocent injured and the bereaved families. As a friendly neighbor, China supports Myanmar's efforts in maintaining peace and stability in the Rakhine state and sincerely wishes that Myanmar could maintain social stability, ethnic solidary and economic development.